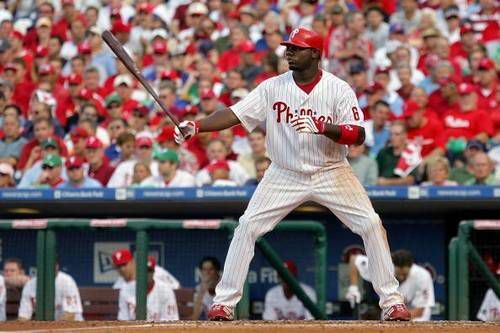 Ryan Howard is one of the star hitters for the Philadelphia Philles baseball team. Howard, a first baseman, won the NL Rookie of the Year award in 2005, and followed this in 2006 with the NL Most Valuable Player award. He has hit 30 or more home runs for the last six consecutive seasons, and is the quickest player in MLB history to reach both 100 and 200 home runs in their career. The Philadelphia Philles were matched against the St. Louis Cardinals for the NL Divisional Championship Series in the 2011 playoffs. The 5-game series was tied 2-2 entering the deciding game on 10/7/2011. The Philles gave up an early home run in the first inning that ended up being the only run scored in the game. The Philles were able to get just three hits all night. In the final inning, Howard came to the plate with two outs, and a chance to tie the game. Howard connected with a weak ground ball, and sprinted toward first to attempt to beat out the throw. A few steps out of the batter's box, Howard suddenly began to hobble, then fell to the ground, clutching his ankle. An MRI two days later confirmed the diagnosis of a ruptured Achilles tendon. The Achilles tendon connects the muscles of the back of the leg to the heel. When these muscles contract, the toes point downward. Therefore, the muscles and Achilles tendon provide strength and power when running and sprinting. An Achilles tendon rupture occurs when the tendon snaps just behind the ankle joint. The rupture almost always occurs a few centimeters above the heel, where the tendon is weakest. When an Achilles tendon rupture occurs, the muscles can no longer point the toes downward, and the strength of the movement is lost. Muscle spasm, swelling, and inflammation can cause acute pain, but the longer-term issues relate to the strength of movement of the ankle. Howard had been having problems with the ankle for weeks preceding this injury. He had been trying to continue to play, but was having a difficult time remaining on the field. Without time to rest before the playoffs, Howard opted for an injection of cortisone around the area of the Achilles tendon. The injection took place about 2 weeks before his tendon rupture. Injecting cortisone around the Achilles tendon is very controversial. Injections into the tendon are known to increase the likelihood of tendon rupture, and injections into the surrounding soft tissues may have similar effects. Usually, if an injection is considered, a lengthy period of rest to avoid tendon ruptures will follow the injection. Younger, active patients typically choose to have their Achilles tendon surgically repaired. While non-surgical treatment is a reasonable option, most professional athletes will opt for a surgical repair. Surgical treatment is accomplished by suturing together the torn ends of the ruptured tendon. As is the case with Howard, surgery is delayed to allow swelling to subside. The surgery itself is not complicated, but there are potential complications of surgery that can be serious. The most concerning surgical complications are infection and healing problems. Cortisone injections in the area of the Achilles tendon are controversial. We know that cortisone injected into the tendon itself is harmful and can lead to Achilles tendon ruptures. However, often the inflammation is found outside of the tendon, either in the tendon sheath or the bursa between the tendon and the heel. In these situations we know much less about potential harm from cortisone injections. Most doctors feel that cortisone should be used in this area as a last resort, following months of traditional Achilles tendon treatment. Furthermore, many doctors will recommend that after an injection of cortisone anywhere around the Achilles, that people rest the tendon for weeks, or even months, to ensure an Achilles rupture does not occur. After rupturing the Achilles tendon, and having a surgical repair, several months of rehab will follow. Rehab protocols vary widely, but many surgeons are now electing to begin motion exercises within weeks of the surgery. Traditionally, patients were casted for several months after surgery, whereas now many patients begin movement soon after surgery. Typically the tendon takes about three months to heal, but normal motion and strength are seldom seen before 6 months from the time of surgery. For a professional athlete like Howard, it may take even longer to fully recover from the surgery.